Many a thriller fails the “But why didn’t they” test: why didn’t they turn on the light, phone someone, tell the police? 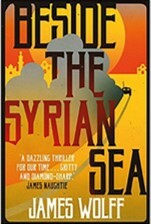 In this well-written and well-informed thriller the hero sets out to rescue his father who is being held by ISIS somewhere in Syria under threat of death. Our hero, Jonas, works for intelligence but from behind a desk. Rather than use his intelligence contacts he takes a leaf from the Edward Snowden guidebook, steals a load of secrets and offers them as ransom to his father’s captors. To do so he goes to Beirut, tricks a former priest into acting as go-between, makes contact with Hezbollah and lets the local British and American intelligence know what he’s about. (He has a plan, but we’re never clear what it is, nor how badly it goes wrong.) Hezbollah and ISIS suspect a double-cross, while the Brits and Americans want him stopped. They know who he is, where he is and who he’s talking to. A whole team of agents assembles in Beirut but, desperate as they are to stop a second Snowden crisis and the priceless secrets falling into enemy hands, they don’t simply grab hold of Jonas and make him disappear. Why didn’t they? Wolff writes well, he knows his subject but his fine leading adversaries fade out at the climax and he hasn’t grasped the essentials of a thriller plot. That’s a shame, because he could write a much better book than this.